I’ve been reflecting this past week on the fact that my youngest will turn 2 in six short days. I can hardly believe it. 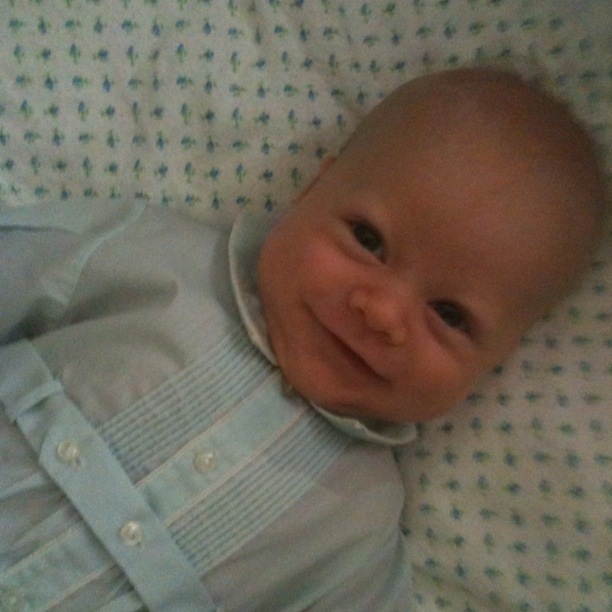 My heart is full of joy at the beautiful child he is becoming, yet at the same time it aches for him to remain a precious babe just a little while longer. Such is the wonderfully complex love of a mother’s heart. The realization that the past two years have flown by even faster than I remember with my oldest son has made me want to slow down these last few days of of my Sweet P’s second year of life just to make sure I have every little precious detail of his babyhood ingrained in my heart and mind so that I may ponder over them when I am old and gray. So, bear with me this week as I sentimentally celebrate the life of my almost-two-year-old. 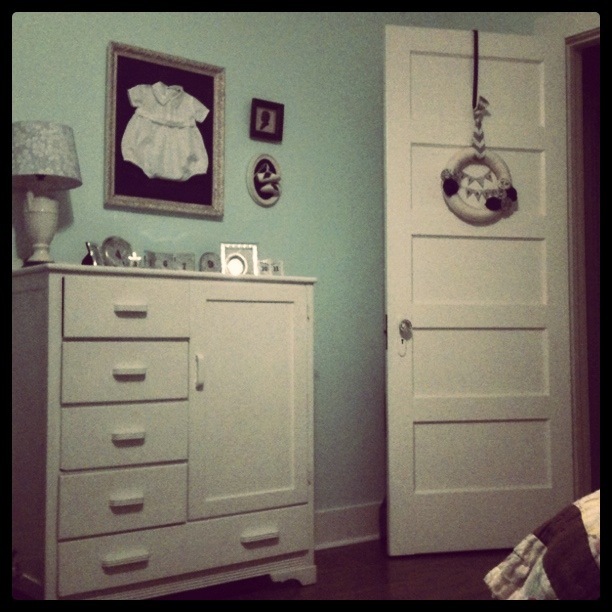 What better place for me to begin than by sharing photos of his nursery. I have fond memories of creating this space especially for him. Even though he is my second child, this was my first nursery to design. (We were renting a small, four-room shotgun house when my first son was born and had practically no flexibility in space or paint color.) 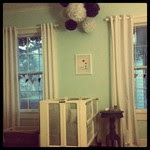 My desire was for this nursery to be sweet yet boyish with hints of vintage and modern elements. I chose the wall color before I knew if le bebe would be a boy or a girl, intending to accent it with navy for a boy or coral for a girl. It’s been fun to find the perfect navy accents, mostly stripes and polka dots. They give the room a playful air. The small wardrobe dates to the 1950s and was originally used by my mother when she was a child. She even scribbled her name on one of the drawers in crayon. My Grandmother handed it down to my mother, who handed it down to me. It has now been used by three generations. 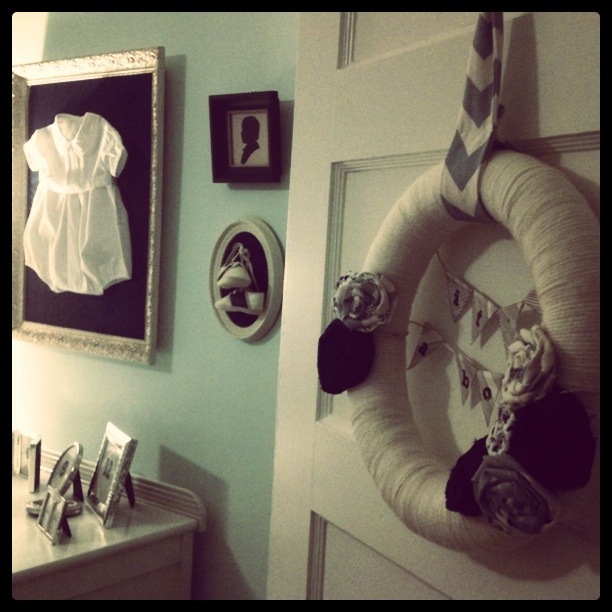 The sweet outfit and baby shoes framed above the wardrobe were my husband’s when he was a baby. My Mother-In-Law thoughtfully passed them down to me when my first son was born. A collection of 12 vintage and modern silver frames are ready to capture the sweet smiles of our little one as he grows so quickly his first year. This crib has also been used by three generations: my mother, myself, and my two boys. It has been restored and repaired for each child and continues to hold up well. I love that it rolls easily. Should we have guests, it is takes little time and effort to roll the baby’s bed into our room for a few days. Above the bed hangs a darling print by Sarah Jane Studios. It reminds me of one of my favorite childhood movies, a short French film called The Red Balloon. The room is large and doubles as a guest bedroom, so it also has a double bed. My husband helped me cut plywood to form the headboard frame. I found the blue and white stripe fabric on the remnant table at the fabric store and knew it would be perfect for the room. The quilt at the end of the bed belonged to my husband’s great-grandmother. It is soft, perfectly warm, and introduces a bit of color into the room. The navy polk dot crib sheets pick up the same hundred-year-old pattern on the quilt. We had recently relocated the original wood shutter closet doors to the exterior of our home. 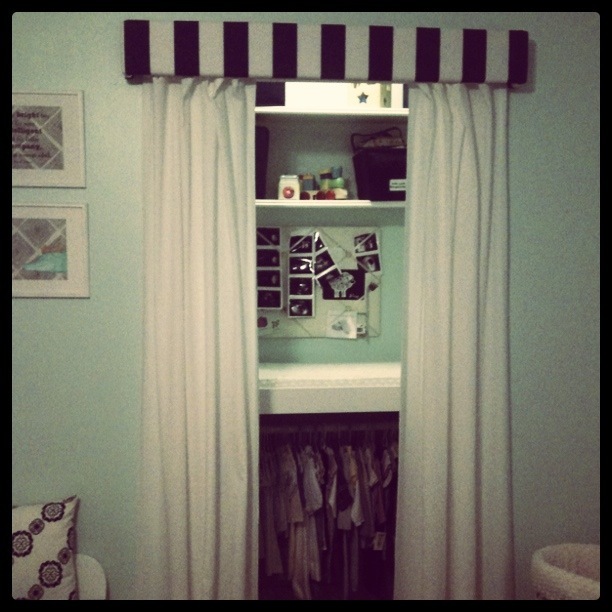 Because I knew we’d be using the closet often, I chose to hang simple white curtains at the opening to make the closet easier to access. 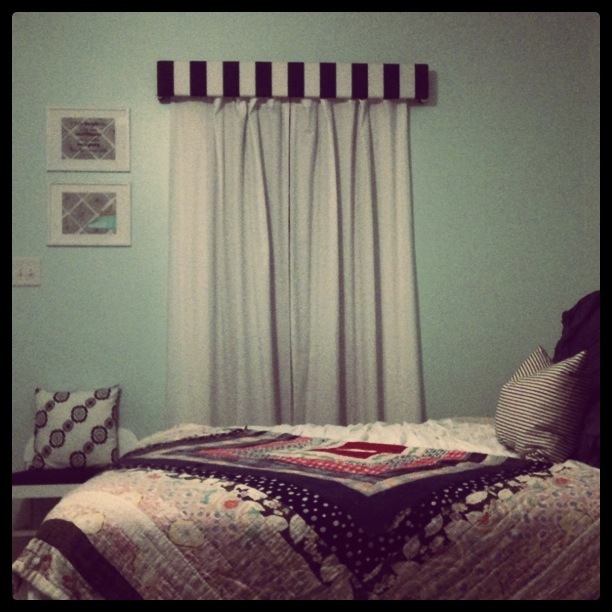 My husband built the cornice and I covered it using leftover fabric from the headboard project. He also added the removable countertop and lower hanging rack. We use the countertop as a changing table and baby clothes are neatly hung below. Two rows of shelving hung along the top of the closet, along with four shelves tucked neatly on the left side, give us plenty of room to store everything from diapers to socks to outgrown clothing in neatly labeled navy cloth bins. As children grow and change, their rooms must change to suit their needs. Soon, the closet will be converted from a changing station to a toy rack, the baby bed will move to the attic, and framed hand-me-downs will be packed back in a box. Of course, I have plans for tweaking and updating this space, but before I begin, I felt it only appropriate to document the space that nurtured my little one during the first precious years of his life. I’m just now finding space in my life to stop and read this. It has been staring at me for days. Lovely pictures and ideas, as usual, from you. I wish I could have seen the crib better—-the picture wouldn’t enlarge. Several thoughts made me smile a big ole grin: The Red Balloon is one of my favorites too. The last time I showed it to a class, they all thought it was stoooopid. So sad, and such a lack of imagination. Also, just wanted to remind you that I still have your own baby bed. I bought it from your mother. 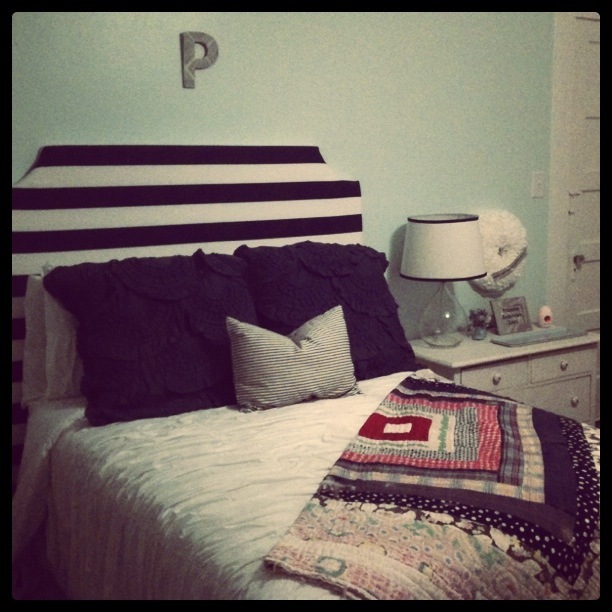 It is a white wicker single bed, with 4 large drawers underneath. It had been a crib with changing station, which cleverly converted to a twin bed and shelves.